The book is barely closed on the first Tyson Fury vs. Deontay Wilder fight, but oddsmakers are already offering action on Fury vs. Wilder II. Fury vs. Wilder II only exists in our imaginations at the moment. The book is barely closed on their first WBC Heavyweight Title fight with a wild finish leading to a draw (+2500 odds) and nothing is set in stone yet for a rematch. However, everybody, including Tyson Fury and Deontay Wilder, wants a rematch and it seems like it's only a matter of time. So why wouldn't oddsmakers offer odds on a prospective second fight? Westgate Las Vegas SuperBook published their odds on Sunday morning, with Fury moving from a +140 underdog in the first fight to the -120 favorite in the rematch's opening odds. Meanwhile, Wilder went from the -170 favorite to the even-money underdog. And don't be surprised if that line gets even tighter as action pours in and talks about another mega-fight progress. Because while their first fight left us all wanting more, it also left us without [any idea](https://www.cbssports.com/boxing/news/deontay-wilder-vs-tyson-fury-fight-results-thrilling-bout-ends-in-split-draw-despite-two-knockdowns/) of who is truly the most dangerous fighter. Fury managed to force Wilder to box technically on Saturday night after a career's worth of swinging for the fences (he entered the fight with a 40-0 record and 39 KOs). That made Wilder incredibly uncomfortable and Fury wound up dominating all the strike stats. However, when Wilder got back to what he's best at, he managed to score two knockdowns. 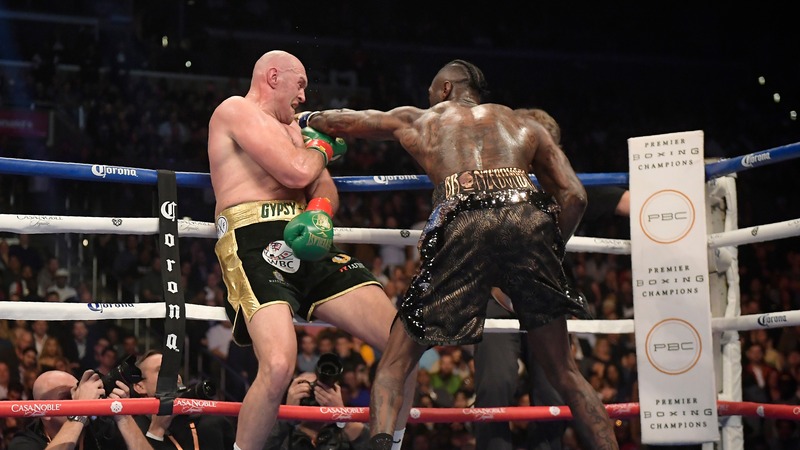 That included a 12th-round combo that looked like it would [stop the fight](https://www.cbssports.com/boxing/video/highlights-from-the-boxing-match-between-deontay-wilder-vs-tyson-fury-on-saturday-december-1st/) for sure with Fury sprawled on the canvas. __More:__ [What oddsmakers were saying prior to Fury vs. Wilder I](https://www.betchicago.com/deontay-wilder-tyson-fury-fight-odds-betting-sharps) But the Gypsy King somehow got to his feet to beat Jack Reiss' count and convinced him that he was good to continue. And after withstanding another 20-second barrage from Wilder, he was, as he wound up taking control of the offense in the final minute. Unfortunately for Fury, that wasn't enough to avoid the 10-8 final round that cost him what would have been a split decision in his favor with two judges splitting and the final scoring the bout 111-111. Both fighters expressed certainty that they had won the fight but now both will carry that draw on the end of their unbeaten records. Which is why we'll need the rematch and why Westgate is looking to capitalize on the interest by offering the early action. Fury vs. Wilder II must go by 12/31/2019 and refunds will be offered if the fight doesn't take place before that date.